Coober Pedy Opal Fields Golf Club. Looking for the perfect place to take your dad – or your partner – on holiday? If swinging golf clubs and a picturesque 18-hole landscape are what he desires most, then it makes sense to work out where some of the most picturesque golf courses in Australia are located. Make sure you get a map ready – and get to booking. The ultimate surfie course, 20km north of the CBD on headland overlooking some of the world’s most famous breaks, Peter Thomson even calls Long Reef “the best site of any golf course in Sydney.” Many surfers come straight from the nearby beach-break and up to the first tee, and on any given day you’ll find former legends like Simon Anderson and current stars like Kelly Slater having a hit between surf sessions. Signature hole: The par four 17th, running right along the escarpment beachfront. Did you know? Long Reef’s strong commitment to the local environment is legendary: they’re extremely particular about eradicating introduced species from their pond systems, and ensuring indigenous flora and fauna thrive. Is your Dad married to the sea? Then this should please him: the turquoise waters of the Indian Ocean are visible from the majority of Kennedy Bay’s 18 holes, so he can watch the waves break while he putts on beachside greens. The Ian Baker-Finch designed course lies nestled between 10,000-year-old sand dunes and natural bushland and is just 40min south of Perth, near the funky seaside town of Rockingham. Signature hole: The 128m par three 16th. Depending on the time of day, you’ll need either a three-iron into a stiff sea breeze, or a gentle pitch with a roaring tailwind. Oh, and the green is only 11 paces wide. Did you know? Kennedy Bay has three more bunkers in total than the home of golf, St Andrews. In about as rugged a surf location as anywhere on the planet, this is for the Dad who likes nothing better than a premium golf course mixed with landscape straight off the set of Endless Summer. Rolling, vine-studded hills, crinkly coastline and crashing waves from Bass Strait, the Cape at Cape Schanck is perched high on a headland with stunning views over the Southern Ocean and Port Phillip Bay. For an extra treat, shout Dad a hotel room here – it’s RACV run, so you can expect good deals and high standards. Signature hole: The par three 16th, sailing 146 terrifying metres over a deep ravine to undulating green. No straight putts here. Did you know? Greg Norman opened the Cape in November 1986, so congrats all round on their 20th anniversary! 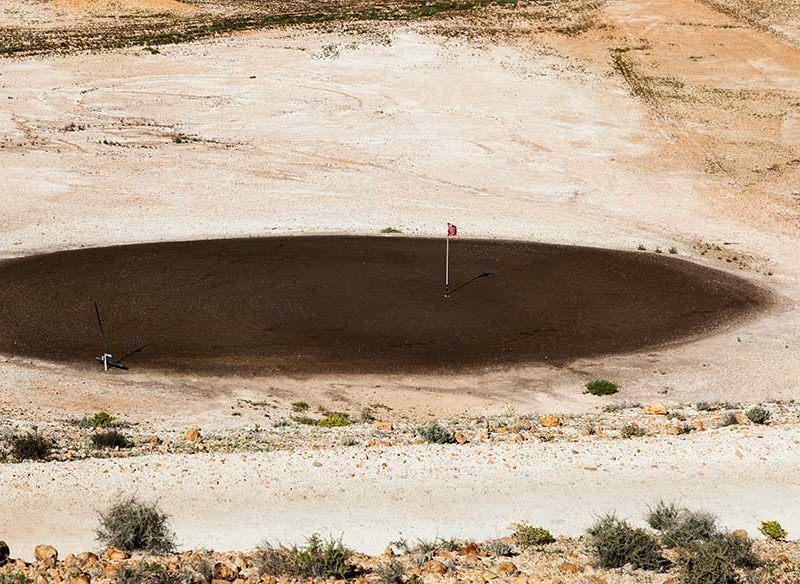 Open since 1976, the Coober Pedy Opal Fields Gold Club is unlike any other golf club in Australia. 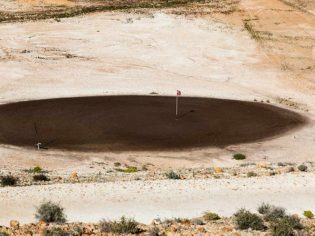 The ‘greens’ are black and the fairways are white, making it one of the most unconventional-looking golf courses in the world. Past golfers have also been known to find opals as they make their way around the 18 hole course. Did you know? Scenes from Mad Max were filmed here!